This blog post is something of a ramble, to start the new year. There is a lot of talk about gentrification, how London is not the same as it used to be. We have what is described as a housing crisis with overcrowding and homelessness on the rise, politicians tinkering with the notion of what ‘affordable’ means, and the prospect of some people never being able to afford to rent or buy in London. 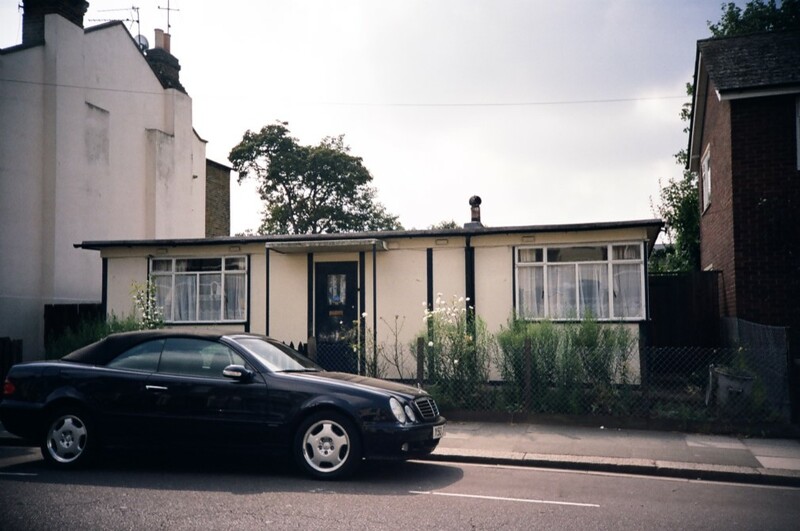 Yet some areas of London have ‘ghost streets’, uninhabited for much of the year, and prefabs left vacant and falling into disrepair and dereliction. Take one area of London. Fulham, in south west London, is described as a ‘prime residential area’ with house prices in the £millions and what you might call gentrified. It wasn’t always like that, and has been decades in the making. I’ve lived my life in London, grew up in Fulham and lived there nearly half of my life. Geoffrey de Havilland, aviation pioneer, built his first aeroplane at his workshop in Bothwell Street, Fulham, in 1909, the street I grew up in. How did he manage to build an aeroplane in such a small street? Ten years later, we moved near the grandly-named ‘Royal Fulham Laundry’. Fulham didn’t have as many prefabs as other parts of London and the last prefab in Fulham, in Irene Road, was demolished in 2005. So how did the transformation from predominantly industrial, working class inner London to prime residential take place and why is it happening all over London, and in other cities like Bristol? And what have prefabs got to do with it? Looking at the 1950s maps in my search for prefabs I discovered that prefab dwellers in Park Street, around the back of Bankside Power Station (now Tate Modern), were hemmed in by chemical, Oxo and printing works with the pungent smells from the Anchor Brewery not far away. The only places that didn’t have prefabs were the square mile of the City of London, the Royal Parks, and Mayfair/Belgravia. Just about everywhere else did. The Queen, captured here in a 1950 film, visited the small group of Uni-Seco prefabs in Park Crescent Mews West, a stone’s throw from Regents Park. This tradition of the Queen (later Queen Mother) visiting and awarding prizes for Londoners’ gardens continued until the 1980s, many of which were awarded to the well-tended prefab gardens. There were prefabs on the edges of Holland Park and Hampstead Heath, off the King’s Road, Chelsea and in Portobello Road, Notting Hill. The river Thames facilitated and encouraged the development of industry. My second job after leaving school was at an oil storage facility (relocated from Millwall to Hammersmith in 1921), The building now houses the very upmarket River Cafe. The next factory along was the Manbre and Garton saccharine works (established 1876), beyond that was the Hammersmith distillery (established mid 18th century), and prefabs occupied Distillery Lane. Apart from Bishops Park and Fulham football ground, the river between Hammersmith and Putney Bridges was lined with factories, distilleries, cement works, wharves and warehouses, and Eternit Wharf. Eternit is the trademark for fibre cement, the kind used as cladding or roofing of the prefabs, then mixed with asbestos. In the mid 1970s I moved to a different part of Fulham, close to the river. Until you got to Wandsworth bridge, there was no way to see it. Between Fulham and Lots Road power stations, a Shell oil terminal, gasworks, wharves and various industries lined the bank of the Thames. On the other side of the river a candle factory, distillery (gin factory), sugar refinery. The smell was so bad, Battersea residents got money off their rates. 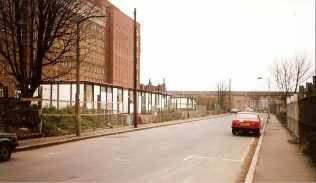 By the early 1980s these industries began to disappear, and blocks of private riverside apartments, supermarkets, health clubs and retail sheds took their place. The candle factory is now a furniture shop. There is a park where the Shell terminal was, with access to the river. So what is the connection with prefabs? My personal experiences of this small area of west London were repeated across the capital and not just by the river. Industries small, medium and large cheek by jowl with housing, schools, churches, pubs, cinemas, theatres and public buildings. Textile and furniture factories, laundries, warehouses, engineering and printing works, garages, iron foundries, corn mills and steel mills, food and confectionery factories, chemical works. 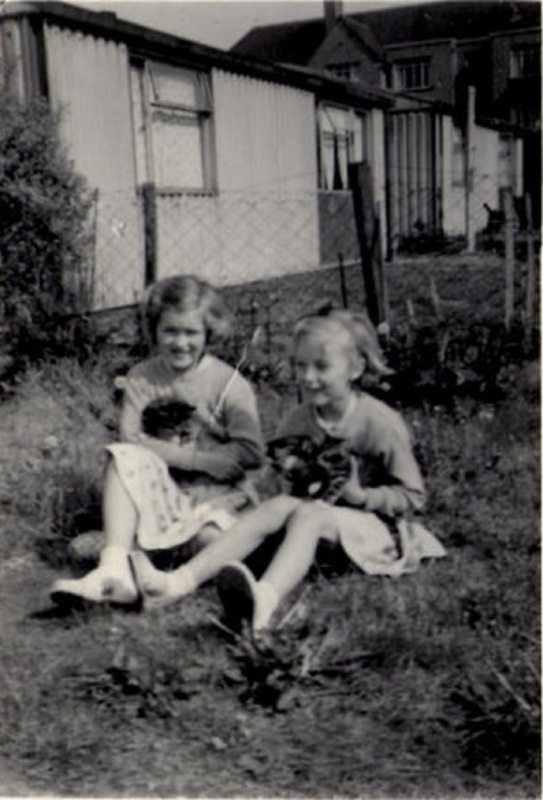 In between, there were prefabs; sometimes a large group or estate, sometimes ten or twelve, a solitary prefab here and there. Where there was work there was housing, including the prefabs. The plans for siting the prefabs in layouts as shown below were often reduced to a row of prefabs in between existing houses or factories, occasionally stacked in two or three rows. POST WAR PLANNING AND RECONSTRUCTION IN BRITAIN: DESIGN MODELS OF PREFABRICATED HOUSING© IWM (D 22075). Models were made to show how the prefabs should be laid out. Locating, acquiring and preparing sites in time was not so easy which explains why prefabs are dotted about – the average site was 9 prefabs. Where there was enough space, the layouts were broadly followed. Because there weren’t enough sites prepared to put the prefabs on, an additional clause was inserted so that larger numbers of prefabs could be erected on parks and open spaces, initially for 10 years. This was extended for a further 10 years when it looked unlikely that enough replacement houses would be built. Hollyhedge Bungalows, an estate of 80 Arcon MkV prefabs, were sited on the western edge of Blackheath and removed in the mid 1960s. The only surviving example is the Excalibur Estate in Catford. 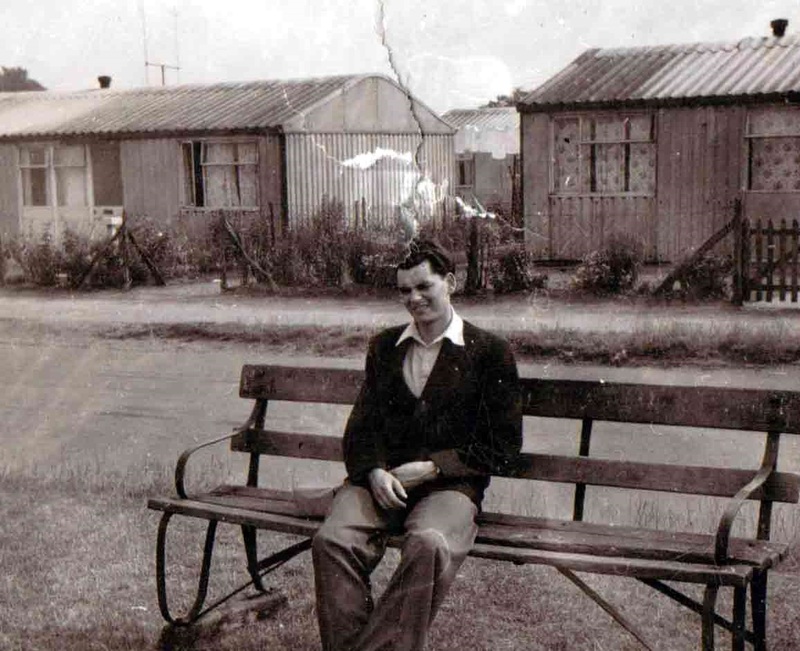 The estate of 187 Uni-Seco prefabs, erected on an open space (requisitioned for allotments in 1941) between 1946-7, managed to escape demolition until recently, despite several attempts from 1970 onward. This peaceful backwater of south London, so reminiscent of a holiday village, now echoes to the sound of construction. And the prefabs? Gradually the families were moved out, and many were dismantled or demolished. Sometimes there was nothing to replace them with, and LCC mobile homes co-habited with or replaced them from the early 1960s. These distinctive bungalows were just as loved as their post-war predecessors. In the early 1970s Acme Housing Association (now Acme Studios) was formed. With agreement from the Greater London Council, they took over some empty properties to use as temporary artists’ studios, including mobile homes in Conder Street, E14. Prefabs still survive mainly in south east London in Brockley, Nunhead and East Dulwich; some inhabited, others not. As industrial London declined, public housing ground to a virtual halt. 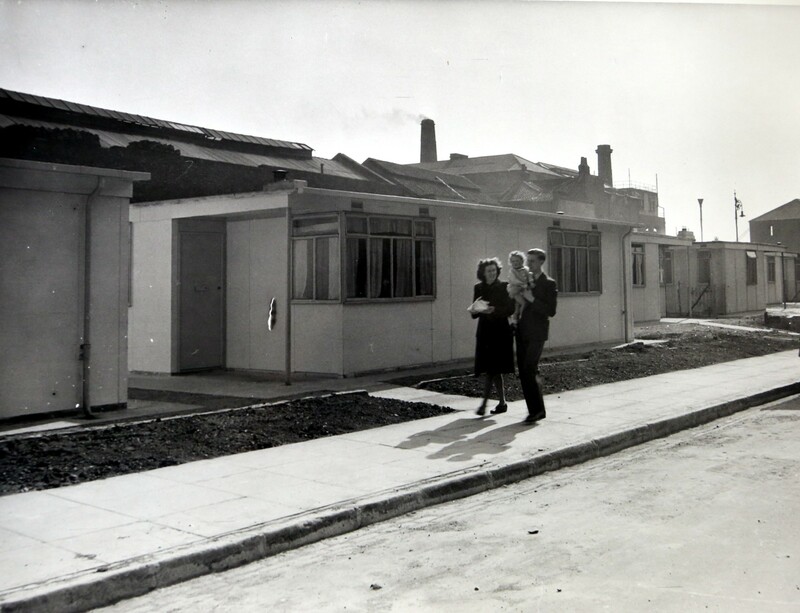 The period when many of the prefabs were demolished in the 1960s-70s saw the last of London’s major council housing schemes and estates under construction or completed. Battersea Power Station, decommissioned in 1983, went through several owners and a Grade II listing before work started in 2012. In the intervening years, Bankside was being transformed into Tate Modern, realising Abercrombie’s 1943 plans for the South Bank. In 1979 exchange controls, introduced in 1939, were abolished. In 1980 Right to Buy legislation was enacted and mandatory Parker Morris living space standards for council housing were abandoned. In 1981 the London Docklands Development Corporation was established and in 1986 the Greater London Council was abolished. The abolition of exchange controls led to foreign investment in property, and inhabitants of Chelsea and Kensington cashed in and moved westwards to Fulham, which is where I came in and when I moved out! I’ve now lived for over 30 years in south east London. The last prefab in Peckham was sold for £920,000 in November 2015. Prefabs are a reminder of how we once solved a housing crisis.